CHRISTMAS IS ALL about making memories – whether it’s giving someone a present that means the world to them or accidentally burning the stuffing. With that in mind, we asked Irish people for some of their most cherished Christmas memories. From surprise trips to the labour ward to celebrating Christmas after losing a loved one, these stories are heartwarming, bittersweet and even a little bit gas. Michelle Malone recalls the Christmas her grandfather passed away and inadvertently brought the whole family together. My maternal grandfather had cancer and died on the 23rd December 1998. My mother and her siblings were in the hospital with their dad so my father had me, my brother, my three sisters and eight cousins ranging in ages from 1-15. My dad got the call Granda passed away and told us as we were eating chips. My cousin Clare tipped a full container of salt over her chips in shock – she still gets jokes about it when she salts her chips around a cousin. In Ireland you can’t be buried on Christmas Day so the funeral was December 26th. This happened to be the year we all got rollerblades from Santa, and even though I was only ten I have the clearest memory of five of us skating around while my Granda was in a coffin in the good room. I’m sure it was horrid for the grown ups, but it was one of the loveliest Christmases because the whole extended family was always together. We had giant Christmas dinners together for days after because everyone already had their turkeys. The legacy still lives on 20 years later because we all still get together on Christmas Day for soup before our dinners and it’s one of my favourite traditions. Eamonn Mullen recalls the Christmas when a merry Santa Claus accidentally ruined his son Cillian’s snooker table… and the last-ditch efforts to stitch it back together. AT 2am Christmas morning, Santa was busy in the sitting room assembling a snooker table for 8-year-old Cillian assisted by his good friend Hennessy, a traditional annual visitor as Santa made his deliveries. Unfortunately this particular year Santa was heavily influenced by Hennessy, causing him to stumble across the snooker table. I can still hear the legs snapping under it and the immediate ‘Oh s**t’ coming from Santa’s lips. Two hours of sawing, hammering and screwing in the garden shed later, the table was back in place, minutes before an excited little eight-year-old burst into the room to see had Santa come. We have dined out on that story every Christmas since. Cillian is now 21 and that table , including the legs, is still in our attic. Grainne Murphy and her husband had planned for a quiet Christmas in her new home. Then her waters broke. It was Christmas Eve morning and it was my first time making Christmas dinner and all that. I was coming down and going to get the stuffing ready. My Mum had taught me how to make stuffing and gravy and all these things I hadn’t a clue how to do. So that was my plan for Christmas Eve. I woke up about eight o’clock in the morning and my waters broke. I was like, ‘Uh-oh, I think we might be having this baby sooner than we thought.’ My Mum was ringing me in the meantime asking about the stuffing but I couldn’t answer her because I was in labour. We rang the hospital and we drove like maniacs in the bus lane all the way into Holles Street. They checked and said, ‘Well you’re not properly dilated, but we’re going to keep you in because your waters broke.’ I spent the next I don’t know many hours in hospital. All of Christmas Eve, the night, and then she was born at quarter to three on Christmas morning. I was in and out of conscious states for most of Christmas Day but I had a new arrival into my life and a completely different focus – a little baby. Following the death of the her father, Aisling McWalter and her family were facing into a tough Christmas – but they found comfort in each other. My father died on November 19th 2010, about five weeks before Christmas, and trying to navigate that Christmas was a difficult one for us. Everything that could go wrong did go wrong. That year was a particularly cold and snowy one so our pipes froze and we had no running water for about five weeks. We had to bring buckets from a neighbour’s house to defrost the toilet on Christmas Eve. The family dog Sam – my Dad’s dog – died exactly a month after my Dad, of a broken heart. But the ground was so frozen we couldn’t bury him so we had to leave his body frozen in the shed until the weather defrosted. We were so not in the Christmas mood, we forgot to get a tree. Then on Christmas Eve, we decided it’d be a weird one to not have a tree. But finding a real tree on Christmas Eve is not the easiest task, and we ended up with a thing that had about four branches and was half brown. We stood around it wrapping it in tinsel and piling on decorations and we all just laughed because it was just so typical of the Christmas we were having. There were a lot of tears, but also so many laughs at the whole situation because regardless of how difficult it was we all had each other and were surrounded with love. Niall Jackson remembers a Christmas Eve rendezvous with his girlfriend in Dublin Airport… kind of. Working in London means myself and my girlfriend don’t always get Christmas at home in Ireland together. Such was the case in 2016 when I spent the days leading up to Christmas in Dublin but had to fly back to London on Christmas Eve, while she was flying ‘home’ to Dublin from Christmas Eve til the New Year. The original plan was to meet in Dublin Airport for presents, hugs and Irish coffees before we continued in our opposite directions, but with the usual delays we had to give up on that. I was going down the familiar glass tunnel towards my Ryanair gate, cutting a lonelier figure than usual, when who came through the opposite direction but Gillian, my girlfriend. While that might sound like something from a Richard Curtis rom-com, the problem now was the permanent glass wall that separates departures from arrivals. It meant we couldn’t even have a quick hug but rather had to paw at each other like we were in some Duran Duran video. We did ask airport staff if they could open it up but got a firm and unromantic, ‘No.’ Although we did find a crack in the glass where we could at least exchange words, the memory that sticks out was that when we finally said our goodbyes, we had gathered a small crowd of well-wishers and gawpers and I was left running for my plane with a nice festively red face. Jessica McKeon explains how a toy gorilla in the nativity crib became one of her family’s favourite Christmas traditions. One year my parents put up a small crib on the hall table. My then 3-year-old sister asked why it was full of animals, so they said it was ‘to protect the baby Jesus’. She ran off and got a toy plastic gorilla and popped it in to protect the baby Jesus. So we put in a gorilla every year now. This was 22 years ago. I think it was the same gorilla for many years, and we’d keep him in our toy box and root him out every year. Then a younger brother came along so I think he may have had another toy gorilla that became the replacement. Once we all got too old for toys the gorilla was packed away safely with all the other Christmas decorations, ready for his time to shine each December. Growing up in the 1980s, Jill Stakem’s parents used to drive her and her siblings to see the Christmas decorations at Dublin Airport. Now that she lives in London, she relishes nothing more than passing through the airport herself each Christmas. 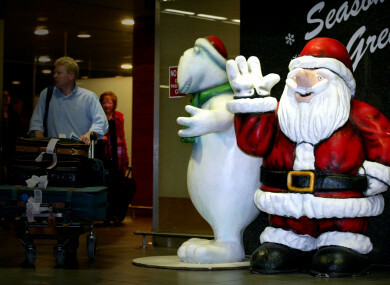 We used to go to Dublin Airport to see the decorations every year. It was one of our Christmas traditions and the airport seemed liked a magical place. We didn’t have a lot of cash growing up – I guess most families in the 1980s were the same – so anything that was free was great! We would drive up – Mam, Dad, my two sisters and me – and it was pitch black. Remember this was pre-M50 so basically it was little dark roads and then out of nowhere these huge, magic decorations. Giant snowmen all over the grounds of the airport! We’d drive around a few times looking out the window to make sure we had seen all the decorations. I guess we thought it was the Dublin version of the Blackpool Illuminations. We didn’t even get out of the car and go inside the airport! There was a huge sign that said ‘Welcome Home’ and my Dad would explain about Irish people having to go away to find work and it seemed so exotic to be coming home for Christmas. Now I live in London and I love coming through Dublin Airport at Christmas. I’m coming home this year with my husband and two-year-old and now I’ll be showing her the decorations. Full circle! With huge thanks to Michelle Malone, Eamonn Mullen, Grainne Murphy, Aisling McWalter, Niall Jackson, Jessica McKeon and Jill Stakem for sharing their stories. Email “'We met in the airport... on opposite sides of the glass': 7 Irish people share their most treasured Christmas stories”. Feedback on “'We met in the airport... on opposite sides of the glass': 7 Irish people share their most treasured Christmas stories”.